Nearly three years ago, I hosted a hand registration domain name contest on my blog. Each of the seven participants shared a list of ten domain names they hand registered as part of the contest, and readers selected who they believed registered the best domain names without knowing who registered what list of domain names. The simple rules for the contest were set out in this blog post, and voting for the contest winner was done in this subsequent blog post. There were 260 votes cast for the winner, and it was my (blind) list that received the most votes. Although my list won the popular vote, the real winner in this contest was Alan Shiflett, who is Partner Sales Manager at Afternic. In speaking with Alan today, he let me know he has sold three of the ten domain names he hand registered! The total value of Alan’s three sales (without commission) is $1,899. Just one sale would have been enough to cover the registration costs on those domain names for more than a year. That’s a pretty awesome sale through rate and a fantastic ROI by anyone’s standards. I don’t recall selling any of the domain names on my list, although it is possible that one or two may have sold at auction. I believe I still own these domain names, so perhaps I will turn out a positive ROI at some point in the future. Congratulations to Alan on his sales. Perhaps he would be willing to share some insight about hand registering and selling domain names. He’s clearly good at it. 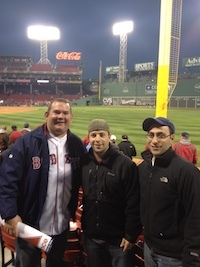 Photo of Alan, my brother and me at game 1 of the 2013 World Series in Boston. Thank you Elliot, I thought I had lost the contest for almost 3 years now. I am definitely not the best at doing hand registrations, as I know of several domainers that make their bread and butter off of it. I typically first focus on a specific industry that I think has a good following (vegans, dog care, bitcoin, music, etc) then I try to come up with names that I would want to use if I were starting a business in that vertical. If you can put yourself in the mind of a small business or end user it helps to come up with names that they will actually want to buy. 30% sell through on hand regs is awesome! I remember that contest. Love that blockchain name- definitely a surging industry! Are you having this contest again? I would love to join and see what names I can reg 99% of my names are handregs. I don’t have any plans to have another contest. Thank you for the info & a great site.